The PaleyFest Fall TV Previews, which celebrate new and returning series with preview screenings and panels, began this week in Beverly Hills, Calif. On Friday night, a live audience got a sneak peek at Hulu’s Future Man, a half-hour sci-fi comedy series executive produced by Seth Rogen, Evan Goldberg, Matt Tolmach and James Weaver. Rogen and Goldberg are experts in the raunchy comedy (This is the End, Pineapple Express, Superbad) and Future Man fits perfectly into their oeuvre. 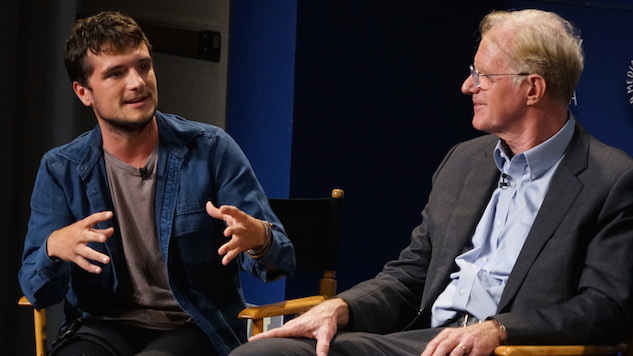 Although Future Man is in the final stages of post-production, we learned a few things about the show from the screening and Q&A with cast members Hutcherson, Coupe, Wilson, Ed Begley, Jr., and Haley Joel Osment and executive producers Matt Tolmach and Ben Karlin. Future Man was originally developed for the big screen. Throughout the evening, the cast and creatives namechecked a number of films that influenced Future Man, including Back to the Future, Terminator 2, The Last Starfighter, even Rick and Morty. Begley was aboard before reading a word. Headly, who plays Josh’s mom Diane in the pilot and several other episodes, passed away in June. Her death profoundly impacted the cast and crew. “There’s no script on how you deal with grief and loss,” Tolmach said. “She was a member of this family. And is. So it took time for people to heal and to deal with it. Haley Joel Osment is racking up those comedy credits. Osment plays Dr. Stu Camillo, a foil for Futterman (in the pilot, anyway). The cast and producers didn’t reveal a lot about the character, but Osment’s been honing his comedy skills lately, with turns in Silicon Valley, Teachers, The Spoils Before Dying, The Spoils of Babylon and Comedy Bang! Bang! Eliza Coupe fights the patriarchy as “Tiger.” Sort of. Coupe told the PaleyFest audience that Rogen described Tiger to her as an “angrier version of Sarah Connor” from the Terminator films. “Oh I can do that… that’s Eliza…” she quipped during the panel. Bodily fluids play a role in the pilot. Future Man premieres November 14 on Hulu.